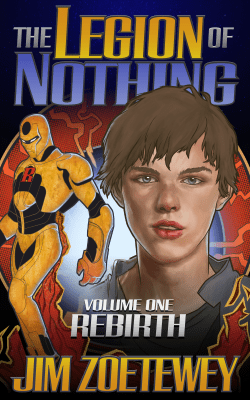 The Legion of Nothing is now available in book form. Specifically it’s available for Kindle. It is available through Smashwords and is currently in print at Amazon (and Amazon.co.uk). Feel free to buy the book, and support my writing financially. Whether or not you’ve bought it, if you’ve read the material (here, for example), please go and rate the book at Amazon or Goodreads and review it. That’ll help me sell more copies. Actually, if you prefer reading on your Kindle to reading on a website, you can actually subscribe to this blog through Amazon. That will just show the most recent updates, however–not any entire book. For three decades, the Rocket and his team were the Heroes League–a team of superheroes who fought criminals in the years after World War II. But Nick and his friends have inherited more than their grandparents’ costumes and underground headquarters… they’ve inherited the League’s enemies and unfinished business. In the 1960’s, Red Lightning betrayed everyone, creating an army of supervillains and years of chaos. The League never found out why. Now, Nick and the New Heroes League will have no choice but to confront their past.